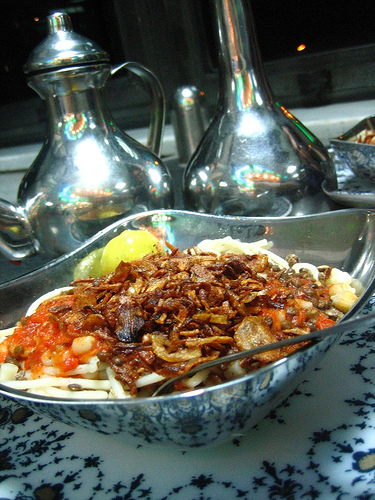 Kushari is a famous Egyptian dish made out of lentils, rice, pasta topped with a tomato dressing. It is highly welcomed by vegetarians and the dressing is te heart of tis dish. Salt 1 tsp + 2 tsp + 1 tsp salt or u can just adjust the taste as u desire. Wash the lentil with water then put it in a pot, pour 3 c water and 1 tsp salt and bring te lentil to te boil..
Lower the heat & allow it to cook for approx 1 hour until lentil is tender but not out of skin. Drain out te water & keep aside. Wash the same pot & bring 4 c water & 2 tsp salt to the boil. Add in the pasta and cook for 10 min.Strain & set aside. Wash the rice . Heat te oil & fry te rice over medium heat for 2-3 min.Pour 2 c water and a tsp of salt bring it to the boil by string until it comes to the boil. Cover te pot with a lid & cook for 15 min over low flame until te rice is nice & tender. remove from heat & set aside for 5 min. Add the pasta & lentil to te rice & mix slightly (toss)pour over it te dressing then top it with the fried onion & serve with other Egyptian dishes like fried fish or kefta. * some people cook the rice with the lentil like Khidchri and then top it wit rest of the items and some like a topping of chickpea as well, it is all up 2 te individual's taste. Note: plz add 1 tbsp vinegar mixed with water while preparing the dressing.